Fifteen million UK internet users have undertaken a 'digital detox' in a bid to strike a healthier balance between technology and life beyond the screen, according to major new Ofcom research. The study of 2,025 adults and 500 teenagers reveals how our reliance on the internet is affecting people's personal and working lives, leading many to seek time away from the web to spend time with friends and family. Ofcom's Communications Market Report 2016 finds that one in three adult internet users (34%), equivalent to 15 million people in the UK, has sought a period of time offline, with one in ten (11%) doing so in the last week alone. Of these digital down-timers, 25% spent up to a day internet-free; 20% took up to a week off; and 5% went web-free for up to a whole month. The most common reasons for taking a 'tech timeout' were to spend more time doing other things (cited by 44%) and more time talking to friends and family (38%). Many people found their time offline to be a positive experience: a third (33%) said they felt more productive, 27% found it liberating, while a quarter (25%) enjoyed life more. However, 16% experienced a 'fear of missing out' ('FOMO') while on the web wagon, 15% felt lost and 14% 'cut-off'. Millions of holiday-goers are purposely abandoning technology. Thirty percent of UK adults have done some form of digital detox holiday. Sixteen per cent of UK adults have purposely visited a destination with no internet access, while 9% have intentionally travelled to a place with neither internet nor mobile phone coverage. Ofcom's report shows that faster internet access is more widely available than ever before, with take-up of superfast broadband and 4G on the increase. By the end of last year, 9.2 million fixed broadband connections were superfast - increasing from 7.1 million in 2014. 4G accounted for almost half of all mobile subscriptions (46% or 39.5 million connections), up from 28% (23.6 million) in 2014, while 97.8% of UK homes and businesses had 4G coverage from at least one provider. Some 71% of UK adults now own a smartphone - up from 66% a year ago - and it remains the most popular device for accessing the internet. People are better connected than ever before, meaning they can spend more time doing what they love online - such as watching the latest on-demand series, or chatting with friends and family via instant messaging services, both of which have seen a recent surge in popularity. Three in four internet users (75%) consider the web 'important' to their daily lives. Nearly eight in 10 (78%) agree it helps keep them up-to-date about current affairs and social issues, while almost two thirds (63%) credit it with inspiring them to try new things such as travel destinations, restaurants, recipes or entertainment. Half (51%) of all internet users agreed that, because of the internet, they never feel bored, while 82% feel that communicating over the web has made life easier. As a result of the internet's importance in many people's daily lives, adult users in the UK currently spend an average of one day per week (25 hours) online; 42% say they go online or check apps more than 10 times a day, while around one in 10 (11%) access the internet more than 50 times daily. Most internet users (59%) even consider themselves 'hooked' on their connected device - while a third (34%) admit they find it difficult to disconnect. Nearly half of internet users (49%) said they were guilty of 'connectivity creep' - spending longer online than they originally intended each day, while 37% said the same of social media. As a result, almost half (48%) neglected housework; 47% said they had missed out on sleep or were tired the next day; while 31% had missed out on spending time with friends and family. 'Tech tardiness' was another reported side effect. One in five users (22%) admitted being late for a meeting with friends or family, and 13% late for work, as a result of being online too long. One quarter of teens (26%) had been late for school, while six in 10 teenagers (60%) said they'd neglected school work. Perhaps as a consequence, many parents are limiting their children's time online. Six out of 10 (61%) teenagers who use a connected device such as a smartphone or tablet reported being digitally 'grounded', having had their device taken away, or its usage restricted. People also reported a lack of 'netiquette' from strangers who can't seem to put their devices down. A quarter of UK adults (25%) complained that someone bumped into them in the street at least once a week because they were too busy looking at their phone. Four in 10 UK adults (40%) felt they'd been 'smart-snubbed' (ignored by a friend or relative too engrossed in their smartphone or tablet) at least once a week; while 17% said this happened on a daily basis. The research also suggests some people are choosing to text or instant message friends and family instead of talking face-to-face, even though they're sitting in the same room. Just over a quarter of UK adults (26%) said this occurred at home, while a third of teenagers (32%) have done so at school. Jane Rumble, Director of Market Intelligence at Ofcom said: "The internet has revolutionised our lives for the better. But our love affair with the web isn't always plain surfing, and many people admit to feeling hooked. Ofcom's Communications Market Report 2016 is a comprehensive annual study of the UK's internet, telecoms, broadcasting and postal sectors. The report acts as a reference for industry and consumers, and provides context and evidence for Ofcom's work in making communications services work for everyone. 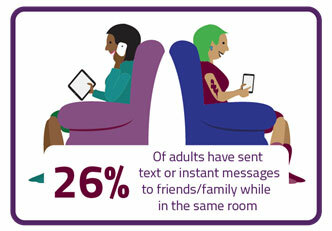 This year's report shows a surge in the use of instant messaging in the UK. The proportion of adults using services such as Facebook Messenger and WhatsApp at least once a week rose from 28% in 2014, to 43% in 2016 - the biggest increase across all communications and media activities. Instant messaging is also considered the single most important means of communication among 16-24 year olds. Photo or video messaging services, such as Snapchat, are now used by 21% of UK adults on a weekly basis, up from 14% in 2014. Ofcom's Digital Day study - published as part of the Communications Market Report 2016 - shows that UK adults are spending eight hours 45 minutes on media and communications each day on average - more time than we do sleeping. Sixteen to twenty-four year olds spend the most time on media and communications, at just under nine hours daily. This digital generation are more likely to embrace a wider variety of newer on-demand and online services, compared with older generations, for whom live TV and radio still dominates their media and communications time. While a digital generational gap clearly exists, the report also shows that many older people are keen to keep pace with newer online and on-demand services. The proportion of 55-64 years who had internet access increased from 82% in 2015 to 87% in 2016, while over half (51%) indicated they used social media and 42% on-demand services in an average week. Smartphone ownership among those aged 55 and over also increased from 32% to 42% year on year, while one in five (20%) now subscribe to a 4G service - up from 11% in 2015. Furthermore, the most significant annual growth in mobile data use was among the older age groups - from 39% in 2015 to 50% in 2016 among 55-64 year olds and from 16% to 21% among people aged 65 and over. Total UK communications revenues generated by telecoms, TV, radio and postal services increased in 2015, rising by £0.4bn (0.9%) to £56.5bn. Average monthly household spending on communication services has decreased in real terms over the past five years - from £121.15 in 2010, to £118.90 in 2015, representing a monthly decrease of £2.25, or £27 per year. Broadcast TV generated record revenues of £13.6bn last year - partly driven by pay-TV subscription income rising to £6.2bn. 2015 was also a bumper year for spending on network programmes, reaching £6.5bn - a year-on-year increase of 3% in nominal terms. On average, each person in the UK watched 3 hours and 36 minutes of broadcast TV per day in 2015, four minutes less than in 2014. But underlying this were marked differences by age groups. Average daily viewing fell by 15 minutes a day among 16-24 year olds, the biggest annual drop for this group since 2010, while it increased by two minutes among over-65s. Live TV viewing fell by five and a half minutes year on year, while recorded and catch-up viewing within a week of broadcast increased by 1.3 minutes. More than half of UK adults (59%) used a video-on-demand (VoD) service during 2015 - up from 57% in 2014. Although the growth of VoD services is slowing for some age groups, paid-for VoD services continued to grow in popularity, with Netflix a prominent driving force. Weekly viewing of paid-for VoD services increased from 18% of UK adults in 2014, to 26% in 2016. Netflix was the most popular service (watched by 23% on a weekly basis - up from 13% in 2014), followed by Amazon Instant Video (7%) and Now TV (4%). Breaking Bad was the most watched programme across these three services in 2015. Total UK telecoms revenues grew for the first time in five years - increasing by £0.2bn (0.5%) to £37.5bn between 2014 and 2015. Average monthly household spending on telecoms services increased in real terms between 2014 and 2015 by £2.52 (up 3.2%) to £82.17 - largely a result of people switching to superfast broadband, which is generally around £10 more per month than standard broadband; line rental prices have also increased. The number of homes with landline telephones continued to fall, decreasing by 0.3 million (1.0%) to 33.2 million in 2015 as people shift to mobile services and instant messaging. Two thirds (66%) of adults now use internet data services on a mobile phone, up from 61% in 2015. The total number of text (SMS) and multimedia (MMS) messages sent each year continued to decline - from 110 billion in 2014, to 101 billion in 2015. Volumes have fallen by around a third since peaking in 2012, largely as a result of growing use of Instant Messaging. Total fixed broadband connections increased by 0.9 million (3.9%) to 24.7 million in 2015. The number of superfast broadband connections rose by 2.0 million (28.7%) to 9.2 million during the year - equivalent to 37.1% of all connections (a year-on-year increase of seven percentage points). The average fixed broadband line used 82 GB of data per month in 2015 - up 41% from the 58 GB per month recorded in June 2014. Total UK radio industry revenue was £1.2bn, remaining stable between 2014 and 2015. Nine in 10 adults (89.6%) tuned into the radio in 2015, while average daily listening time remained broadly stable year on year for all ages at 3 hours 3 minutes. However, the average time spent listening each week by the 15-24s has fallen by five hours in the past ten years. 16-24s spend just 29% of their audio listening time tuning in to live radio, compared to 71% for all adults. 16-24s spend almost equal amounts of time listening to live radio as they do to streamed music (25%). The number of adults using streaming services such as Spotify or Soundcloud has increased year-on-year, from 13% to 19%. In Q1 2016, over two-fifths (44.1%) of radio listening was through a digital device - increasing from 39.6% in Q1 2015. 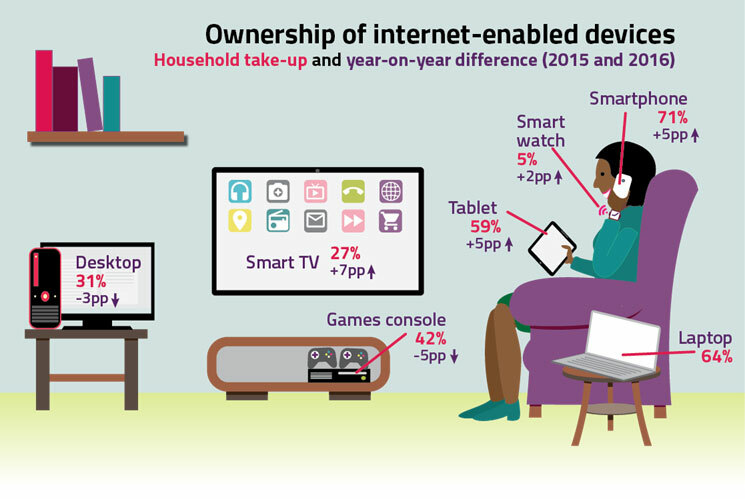 Eighty-six per cent of adults now have home internet access via any device. Smartphones are considered the most important device for internet access (by 36% of internet users), followed by laptops (29% of internet users). Tablets (up from 54% to 59%), smartphones (up from 66% to 71%), smart TVs (up from 20% to 27%) and smart watches (up from 3% to 5%) saw year-on-year increases in ownership between 2015 and 2016. Addressed letter volumes continued to fall in 2015 (by 3.7% to 12.2bn) and at a faster rate than in 2014. Addressed letter revenues decreased by 2% to £4.2bn during the same period. With almost a quarter of adults (23%) saying they prefer to shop online, the demand for parcel services remains high. Royal Mail estimates that parcel volumes in the UK will grow at 4% per year over the medium term. The average number of postal items sent by UK adults per month was 6.6 in 2015, of which 1.2 items on average were parcels. While six in ten adults (59%) say they are very or fairly reliant on letters and cards as a way of communicating, the use of digital substitutes remain high. A majority of adults in the UK (56%) say they prefer to send emails rather than letters whenever possible. Nearly half of adults (47%) say that they only use post if there is no alternative. Ofcom's Communications Market 2016 Scotland. Ofcom's Communications Market 2016 Wales. Ofcom's Communications Market 2016 Northern Ireland.